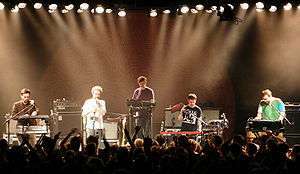 Hot Chip are an English indietronica band formed in London, in 2000. They have released six studio albums: Coming on Strong (2004), The Warning (2006), Made in the Dark (2008), One Life Stand (2010), In Our Heads (2012), and Why Make Sense? (2015). The group has also been nominated for the Mercury Prize. Early formative releases included the Mexico EP on Victory Garden Records (VG14), and the self-released San Frandisco EP. After years of self-releasing records, they signed with Moshi Moshi in 2003 and released their debut LP Coming on Strong in 2004. During this period, they were joined by Felix Martin and Al Doyle. They started working on their second album and signed a UK and US record deal with DFA Records and EMI. DFA and Astralwerks released their debut album for the first time in the US in late 2005. In 2006, Hot Chip released their second album, The Warning. Now signed to EMI in the UK, the band gained more mainstream appeal as well as the attention of critics. The album was shortlisted for the 2006 Nationwide Mercury Prize and was Mixmag's Album of the Year 2006. This album spawned also two UK top forty singles: "Over and Over" in March 2006 and "Boy from School" in May 2006. "Over and Over" received attention for its music video, which was directed by Nima Nourizadeh, and was also named as the best single of 2006 by British music magazine NME. The band released their third studio album, Made in the Dark, on 4 February 2008. The first song to be released from it was "Shake a Fist", which was released as a limited one-sided 12" in August 2007. The second release was "Ready For The Floor" in January 2008, which peaked at number six on the UK Singles Chart. In order to promote "Ready for the Floor", the band appeared on Friday Night with Jonathan Ross in January 2008, and Joe Goddard appeared on Never Mind The Buzzcocks on 31 January. In February 2008, the band performed on the American talk shows Jimmy Kimmel and Carson Daly. At the end of 2008, "Ready For The Floor" received a Grammy Award for Best Dance Recording nomination, but the song later lost out to "Harder, Better, Faster, Stronger (Alive 2007)" by Daft Punk. On 7 May 2008, the group performed their third single, "One Pure Thought", on Radio 1's Live Lounge. The hypnotic clip for "One Pure Thought" was selected as one of the best music videos of 2008 by AllMusic.com. Having completed a world tour in February 2009, Hot Chip returned to London and began writing and recording their fourth album, One Life Stand. In early 2009, Alexis Taylor told NME that the band recorded new songs including "Alley Cats", which the band played regularly while touring in 2008/2009. Initially, Taylor hinted that the album was going to be "a bit calmer this time" in comparison to Made in the Dark with songs that are "more mid-tempo and disco influenced", although the two tracks released prior to the album, "Take It In" and "One Life Stand", suggest that it will be more upbeat than first suggested, and may be more influenced by early house music. Alongside the regular band members, Hot Chip collaborated on several of the album tracks with the drummer Charles Hayward from This Heat and Camberwell Now, Leo Taylor, drummer from the London-based band The Invisible and the Trinidadian steel pan player Fimber Bravo. One Life Stand was released on 1 February 2010. Their self-produced fifth studio album In Our Heads was released on 11 June 2012 by Domino. About the album, Alexis Taylor stated, "I think "In Our Heads" was a bit speedier, and made with less pressure, but more fun – partly due to people in the band not having too many hang ups about how good the material was – we seemed to be happy with the songs we were writing and they came quickly – and partly due to the fact that we had been enjoying ourselves elsewhere, whether at home, or on tour, or recording with our other projects, or DJing. I think that is right about [having a] subtler confidence, but it may also be that we are a bit more accepted these days as we keep doing what we want, and gradually people stop saying ‘why’ to everything and each decision. The songwriting developed quickly from songs that were dreamt ("Now There is Nothing"); songs that were written via email file sending (fully fleshed out instrumentals from Joe developing into songs with added percussion/chord changes and singing by me; e.g. "Flutes"); songs that we bashed out in collaborative writing sessions between Joe and myself ("Don’t Deny Your Heart", "How Do You Do? "); songs that one or the other of us wrote largely separately "‘These Chains’"– Joe/"Look At Where We Are"- Alexis); songs that a few of us in the room wrote more of: "Dark and Stormy", or to some extent "Let Me Be Him" (at least in chorus terms); or finally songs that were written after we completed the last album and which were still in our minds: "Always Been Your Love", "Doctor"." "Dark and Stormy" has been since released as a non-album single. On 10 February 2015, the band announced their sixth studio album, titled Why Make Sense?. The first single from the album, "Huarache Lights", was released on the same day. The album was released on 18 May 2015. Hot Chip performing at the O2 Leeds Academy, 26 October 2008. During live performances, Hot Chip reinvent their studio compositions to form what has been described by Glide magazine as "heavy beat-driven improvisation[s]" that create "an atmosphere of excitement, energy and the unexpected." Festival appearances include V Festival, Dour Festival, Glastonbury, Treasure Island Festival, Roskilde festival, Sónar, Benicassim, Electric Picnic, Bestival, Lovebox Festival, Bonnaroo, the Reading and Leeds Festivals, the Big Day Out, Melt! festival, T in the Park, Summer Sundae, Splendour In The Grass, Lollapalooza and Lollapalooza Chile, the Brazilian Tim Festival, Oxegen, Coachella, Way Out West Festival, Austin City Limits, Ultra Music Festival, and the Osheaga Festival. The band is also known for its DJ talent; they have released several mix CDs and mixes for national and international radio stations and they all DJ regularly worldwide. Al Doyle played guitar with LCD Soundsystem on tour and was present during their last concert at Madison Square Garden. In April 2012 'Boy From School' featured in The Simpsons episode A Totally Fun Thing That Bart Will Never Do Again. Hot Chip released a DJ-Kicks compilation album in 2007, and in 2009 a DJ mix album A Bugged Out Mix by Hot Chip on the Bugged Out label. In 2008, the band released an EP which included collaborations with Robert Wyatt. Wyatt sang and reworked versions of three tracks from Made in the Dark, and the Hot Chip with Robert Wyatt and Geese EP also included a remix by Geese, a string quartet based in London who have regularly contributed to Hot Chip's recordings. Alexis Taylor released a solo album in 2008 entitled Rubbed Out, which saw him focusing more on the fundamental sounds used by Hot Chip leading to a more downtempo and bluesy album than Taylor's works with Hot Chip. Joe Goddard has also released solo productions including "Bassline '12" and "Gabriel", the latter of which was featured in the 2013 video game Grand Theft Auto V. He has also remixed songs from other artists including Disclosure, Breach, Dirty Projectors, Nneka, and Kanye West. 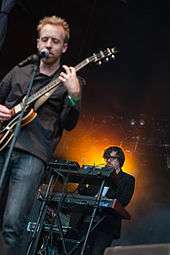 Rob Smoughton aka Grovesnor – a member of Hot Chip from 2001 to 2003 when he left to start the solo project Grovesnor. In 2009 he returned as the band's drummer for the "One Life Stand" tour and in 2012 moved to guitar, bass, percussion, backing vocals and synths. He features in the videos for "Night and Day" and "Don't Deny Your Heart" and regularly records with the band, featuring more prominently from the album "In Our Heads" onwards. Richard Kylea Cowie (Wiley) - Vocals for 'Wearing My Rolex' live. Sarah Jones (of NYPC) – began playing live drums and backing vocals for Hot Chip's 2012 tour and featured in their official music video for "Night and Day" directed by Peter Serafinowicz. ↑ Gibson, Owen (19 July 2006). "Mercury judges opt for eclectic shortlist". The Guardian. Retrieved 27 October 2008. ↑ "Hot Chip named track of the year". NME. 10 December 2006. Retrieved 27 October 2008. ↑ "Hot Chip: New Album 'One Life Stand', Out 8th February!". Facebook. 10 November 2009. Retrieved 10 November 2009. ↑ "Hot Chip cover Joy Division and Vampire Weekend". NME. 10 September 2008. Retrieved 23 September 2008. ↑ "Hot Chip's New Album In Your Heads Very Soon!". Domino Recording Company. 1 March 2012. Retrieved 1 March 2012. ↑ "Don't Deny Your Heart: Hot Chip". Love and Dishwater Tablets. 20 July 2012. Retrieved 23 July 2012. ↑ Calarco, David (30 April 2008). "Hot Chip Show Review at The Fillmore, San Francisco, CA 4/24/08". Glide magazine. Retrieved 23 February 2009. ↑ "Album Reviews: Alexis Taylor: Rubbed Out". Pitchfork Media. 21 November 2008. Retrieved 20 June 2010. Wikimedia Commons has media related to Hot Chip.